Dubbed the Million Student March, campuses all over the country participated in rallies, walk-outs, and marches for free education. Students at the City University of New York’s Hunter College in New York City joined students at over 100 campuses across the United States on November 12 in a day of action for free education, student debt cancellation and a $15 minimum wage for campus workers. Dubbed the Million Student March, campuses all over New York City and the country participated in rallies, walk-outs and marches. The march was inspired by the Fight for $15 campaign, where fast food workers have demonstrated in favor of a $15 minimum wage multiple times this year. The march also occurred amidst a backdrop of campus activism against racism in schools like the University of Missouri and Yale. The class of 2015 is set to be the most indebted class in U.S. history, likely to only be eclipsed by next year’s class if trends in the cost of education continue. According to the Department of Education, between 2002 and 2013, “prices for undergraduate tuition, room and board at public institutions rose 39 percent, and prices at private nonprofit institutions rose 27 percent, after adjustment for inflation.” Tuition at the City University of New York schools like Hunter College, is set to be raised by another $300 per year soon. Students at four CUNY schools held demonstrations on their respective campuses throughout the day on Thursday and then began rallying outside of Hunter College in midtown Manhattan at around 5 p.m. Students and activists from various organizations spoke on education costs and a variety of other issues like police in schools and communities of color, racism at Missouri and other campuses, and CUNY investment in and support of Israeli companies. These connections between different but intertwined forms of oppression were also made in campuses across the nation. 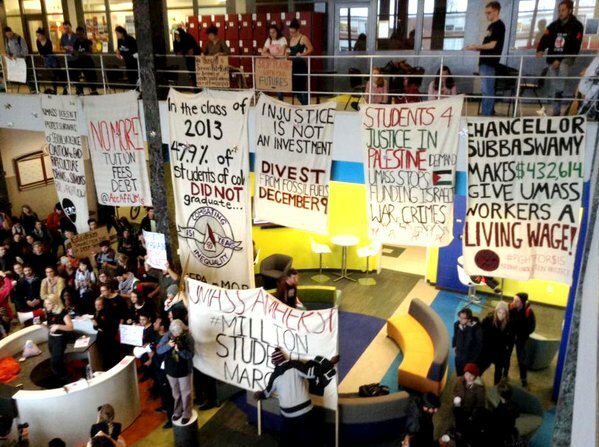 At the University of Massachusetts-Amherst, students spoke about getting their school to divest from fossil fuels and chanted “1,2,3,4! Climate change is class war! 5,6,7,8! Racial justice cannot wait!” At the University of California-Davis, students chanted in solidarity with students at Missouri, and students at Claremont McKenna College, whose dean resigned on Thursday amidst student protests against campus racism, chanted against white supremacy as well. Back in New York, after the rally outside Hunter College, students marched to the front of a nearby building where CUNY Chancellor James B. Milliken rents an $18,000 per month apartment. CUNY faculty and staff held a similar protest outside the chancellor’s apartment building on October 1 for a contract and a raise, and the students at the Million Student March expressed their support for them. The Million Student March’s website also contrasted the high salaries of school administrators with the pay of campus workers currently fighting for a $15 minimum wage. “While top administrators take home six and seven figure salaries, many campus workers are paid poverty wages and are forced to rely on federal and local assistance,” a statement on the website said. According to the New York Times, Chancellor Milliken makes $670,000 per year. The New York City Police Department prevented the students from getting too close to the luxury apartment building, even threatening to make arrests at some points, as students rallied and chanted outside. 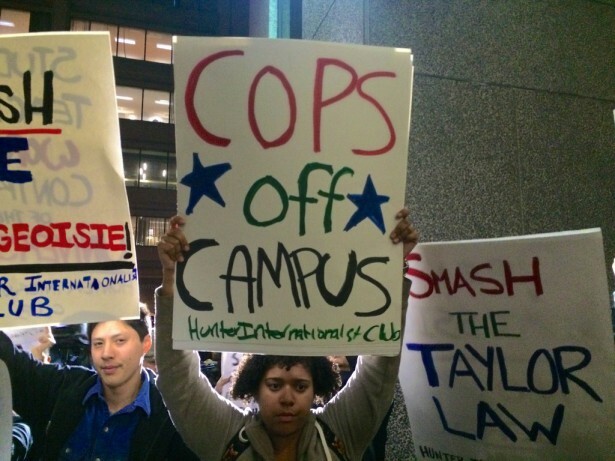 The students then marched back to Hunter College where more people spoke, and organizers told students to show up in front of Baruch College on Monday. 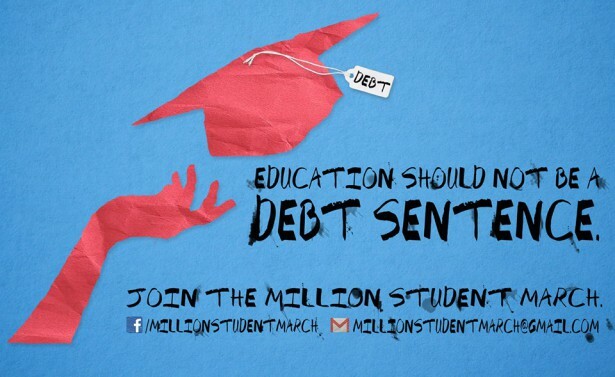 Nationwide, the Million Student March organizers are also making sure that the recent upsurge in student activism doesn’t stop here and that students keep fighting to win a free, quality education.